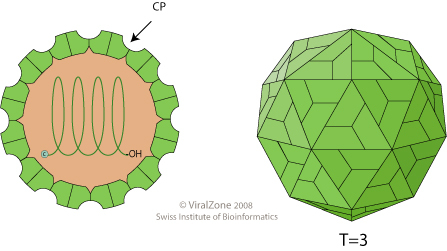 Non-enveloped, isometric capsid with T=3 icosahedral symmetry, about 30 nm in diameter. Monopartite, linear, C-rich, ssRNA(+) genome of 6-7.5 kb. The 3'-terminus may have a tRNA-like structure or a polyA tract, depending upon the virus. The virion RNA is infectious and serves as both the genome and viral messenger RNA. The virion RNA is infectious and serves as both the genome and viral messenger RNA. The ORF1 encodes a polyprotein whichis expressed by leaky scanning. The capsid protein is translated from a subgenomic RNA. The viral RNA is translated to produce the protein necessary for RNA synthesis (replication and transcription). The RdRp recognizes an internal subgenomic promoter on the negative-sense RNA to transcribe the 3’co-terminal subgenomic RNA that will generate the capsid protein. TRANSMISSION Mechanical, vector=insects. Leafhoppers for Marafiviruses; Beetles for Tymoviruses. Turnip yellow mosaic virus 98K replication protein counteracts degradation of its RNA-dependent RNA polymerase (RdRp) by the host ubiquitin-proteasome system. The viral 98K replication protein mediates deubiquitylation of RdRp leading to its stabilization .